The Samyang 24mm f1.4 ED AS IF UMC Lens is a wide-angle lens perfect for landscape, travel and documentary photography. The Samyang 24mm f/1.4 is a manual focus lens constructed of 13 lenses (including 4 ED glass elements) arranged in 12 groups, with multi-layered and anti-reflective UMC coatings to help prevent ghosting and flare and to ensure a high-contrast image. Thanks to its fast f1.4 maximum aperture, the Samyang 24mm is a good low light performer and a great all-round lens for travel photography. 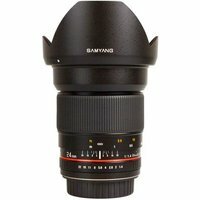 The Samyang 24mm f1.4 lens is suitable for both full-frame and cropped sensor cameras. UMC stands for Ultra Multi Coated, which indicates that the lens has been covered with multi-layered, anti-reflective coating which minimises reflections and increases image contrast. This lens is a manual focus lens and does not have autofocus (AF).